The NYSTCE Assessment of Teaching Assistant Skills (ATAS) — Your Path To A Rewarding Career! Top test prep tactics to quickly pass. Where to find best NYSTCE practice test worded and structured like the real exam. Few careers can provide the levels of responsibility, satisfaction and fulfillment that teaching brings to teaching assistants. Each day, thousands of teacher’s assistants across the country help their students to study, learn and reach for their dreams. We commend you for striving to get your New York State Teaching Assistant certificate. Don’t wait – start studying for this assessment today. Teacher’s assistants touch lives in ways that no one else can. Everyone remembers at least one teacher who provided them with encouragement and inspiration, and the help and advice that they needed just when they needed it most. You are one small step away from becoming such a teacher. You need to register for and pass your NYSTCE Assessment of Teaching Assistant Skills exam. But teacher’s assistants don’t just inspire and educate. As a Teaching Assistant, you’ll enjoy respect from your family and friends, and a social status given to few other professionals. You’ll have long paid vacations that will enable you to enjoy your life, spend more time with friends and family and/or pursue your own goals. And you’ll have an income that will bring you independence and a career path that can lead you from challenge to success. All that stands between you and a rewarding career of educating, guiding and inspiring students right now is your NYSTCE Assessment of Teaching Assistant Skills registration and high quality study time. You should do what’s necessary to pass your ATAS test. Begin with a sound NYSTCE Assessment of Teaching Assistant Skills study guide. 77% of New York State Teacher Certification Examinations Assessment of Teaching Assistant Skills test takers who failed this test state their problem wasn’t that they didn’t study enough. Their issues wasn’t that they didn’t know the content knowledge. It was skill and process “applying the knowledge” to complex test questions and answer selections that tripped them up and lead to failure. Therefore, take as many NYSTCE Assessment of Teaching Assistant Skills practice test questions as you can. Allocate at least 30% of your total review time before your exam day to preparing with NYSTCE ATAS practice tests. Not only will your ability to take and get correct answers improve, you’ll tap into “active learning.” Hands on learning will increase the rate you learn the material faster than anything else. It’ll also boost your recall during the exam through repetition and practice with NYSTCE ATAS sample exams. And don’t be surprised if your text anxiety and worries about the exam greatly diminish. Real NYSTCE Assessment of Teaching Skills test practice tends to build real confidence and competence. That in turn reconditions your subconcious mind breaks the type of test anxiety that harms your performance on your testing date. The NYSTCE ATAS is intended to prove to that you have the basic knowledge and ability to teach your subject in a classroom. The exam consists of a series of tests that examine your specialized knowledge as well as your teaching skills. The road to teacher licensing in New York is a challenging one. With hard work and, no less importantly, the right test preparation, you should find it easy to pass the NYSTCE and start your teaching career. 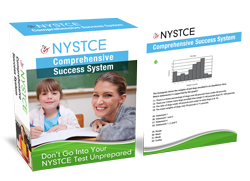 Go to: NYSTCE Test Study Guide now.